Apartments.com has rolled out a series of updates and new features that make the site increasingly personal, usable and useful to consumers. The company's decisions are informed by data and focus groups with renters and landlords across generations. Streamlined map search, a neighborhood drawing tool and planned commute capabilities put more control in the hands of the consumer. Before users even enter any property search criteria, apartments.com gets them excited about their city. A renter in Chicago visiting the site is greeted with Navy Pier’s familiar Ferris wheel and the cerulean Lake Michigan. At the same time, an apartment hunter in the Bay area would see a vibrant image of the iconic Golden Gate Bridge. Those hailing from Austin, Texas, are welcomed with a shot of the capital. The Apartments.com imagery for site visitors in Chicago. The list goes on for the top market areas, including Atlanta (Centennial Olympic Park), Washington, D.C. (cherry blossoms), Los Angeles (sun and tangled highways), Miami (palm trees), San Diego (Pacific views and cityscapes) and more — the photography is automatically customized per a user’s geolocation. This is just one of the many updates that apartments.com has implemented over the last couple of months and beyond, a series of rollouts making the site increasingly personal, usable and useful to consumers. Apartments.com is making the property search increasingly personal. “Everybody has different needs,” said Heidi Williams, vice president of product management for apartments.com. She spoke about the range of consumers on the hunt for the right place. You might be serving a 35-year old recently divorced mother who is interested in safe neighborhoods and good schools (but not so much public transportation) as well as empty nesters who are looking to be by theaters and restaurants within walking distance. But the company doesn’t take any chances or make assumptions about what their users want. Indeed, the new features, updates or products released every three weeks are driven and informed by data, focus groups, and meetings with renters and landlords across generations. To learn about what users want, the team at apartments.com speaks with renters & landlords. During the home search, the opportunities must be broad enough to cater to all without overwhelming users — who won’t take advantage of the tools available if they aren’t easy and right in front of their eyes. 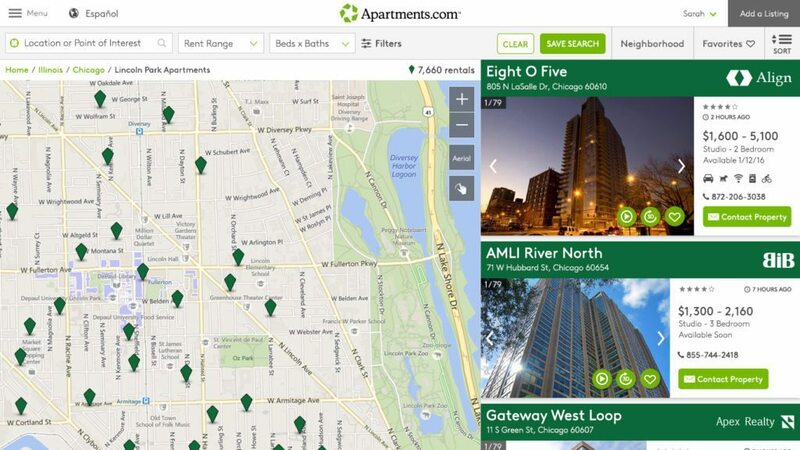 These nine new features show how apartments.com is finding that balance. In addition to the custom regional imagery, a visitor on apartments.com will see key amenities or search factors featured prominently, items that are rotated based on their location. The homepage is built on a masonry grid (think: Pinterest style), which gives the elements on the site a clean and organized look and allows for flexible positioning. The main search bar also helps users narrow down their hunt from the get-go by suggesting points of interest based on the first words they type. Someone who enters “Chicago” may actually be looking for something near the airport or a specific campus within a university (De Paul, for example), which will auto-populate if it’s part of the site’s database. She added that many users might be familiar with a well-known area but looking for budget-friendly alternatives, and that’s when points of interest can be a game changer in securing a great location plus the square footage and amenities they desire. The streamlined map functionality gives context to the property hunt. Users can zoom, click and hover without lag or having to compromise on thorough inventory. “[Consumers] spend a ton of time on the map, panning and zooming and just getting a quick preview of all of these different properties,” Williams said. The planned commute feature on apartments.com was launched early last year, and the company has made continual improvements to its depth and functionality. Users might leverage it to find a place a certain distance from work or their favorite locales. 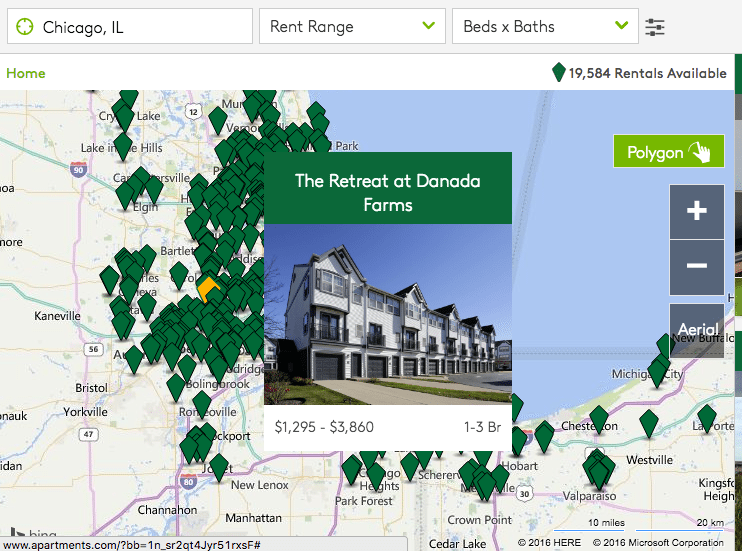 Below you can see the available properties that are a 15-minute bike ride from the Chicago’s Drake Hotel. Many people envision “home” not so much as a building or space, but a specific neighborhood feel. The polygon drawing tool puts more control in the hands of a consumer looking to be within a given radius. Many people envision “home” not so much as a building, but a specific neighborhood. 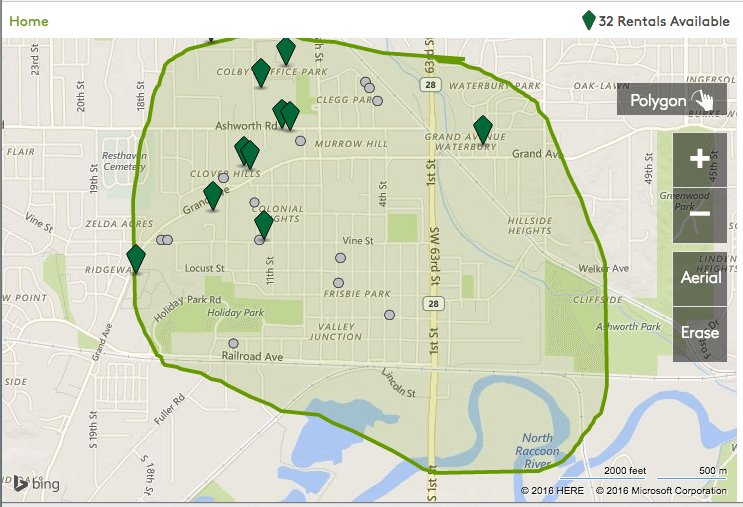 A great area in my city of Des Moines, Iowa, is Valley Junction, which has local shops, cafes and events — you can see right away how the availability is pretty limited (the little gray dots are unavailable buildings — more on that below). Polygon search tool on Apartments.com. There are good 3-D tours and there are bad 3-D doors, the latter of which make people dizzy. 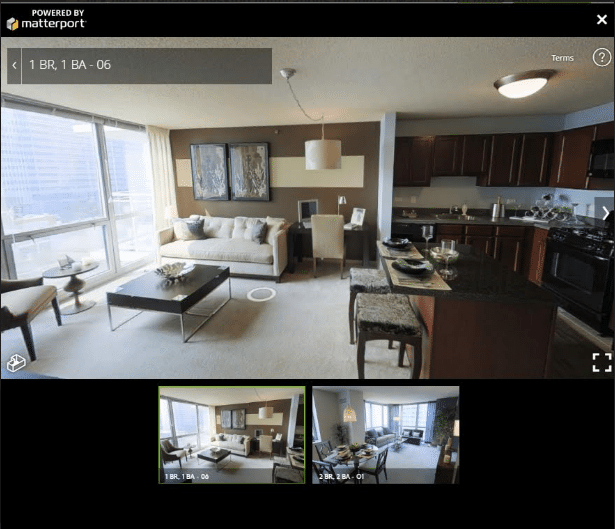 Apartments.com completes its 3-D visuals with staff onsite and Matterport cameras. What’s perhaps most significant about them is the level of detail, adding to the already high-quality imagery. Ever curious about what the bathtub actually looks like behind the curtain or whether the closet is truly “walk-in?” The photographers are expected to shoot every nook and cranny. Paying advertisers are allotted four 3-D tours with their package, which might include shots of a one-bedroom, two-bedroom, plus the common area and pool. Property owners who list for free on the site can upload unlimited photos. Older users of apartments.com still tend to favorite the video listings, Williams said, while the 3-D offerings attract high levels of engagement from the younger crowd. A large part of user experience design is taking educated decisions, testing them and making tweaks based on the data. The features that aren’t getting used can tell you just as much as the features that are. A large part of UX design is taking educated decisions, testing them and making tweaks. Apartments.com does a lot of this UX research, switching around the placement of its various tools to discover which design captures the most engagement. The examples below show how the company is performing some A/B testing with the listing “placards” — or the user’s first view of a property — to see what resonates. 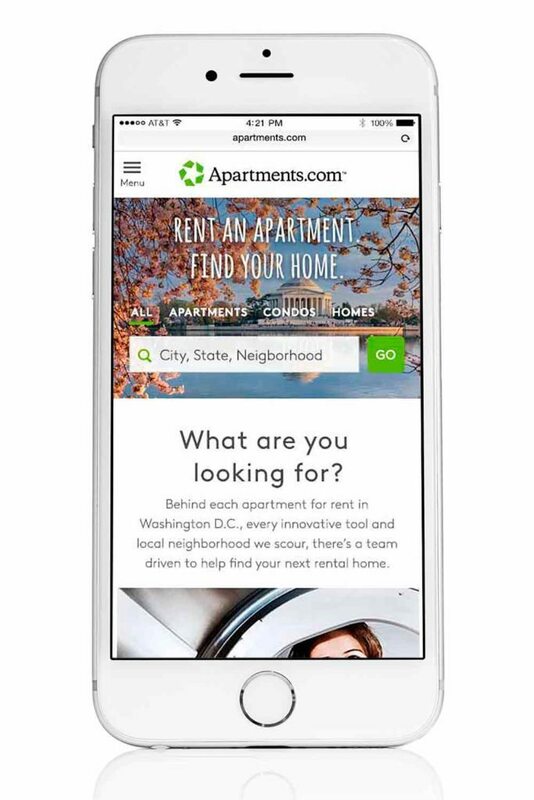 The search services on apartments.com are fully responsive, accounting for every breakpoint, or the place at which your site responds to provide the best layout for your user’s device. The search services on apartments.com are fully responsive, accounting for every breakpoint. 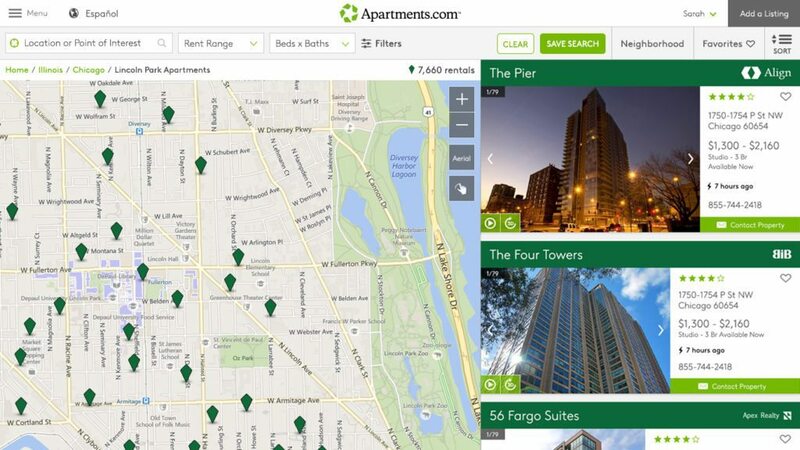 It may seem counterintuitive to allow searchers to view unavailable buildings, so when apartments.com first launched, it only displayed those properties with open units, leaving a few hundred thousand in the database behind closed doors. But the company learned that hedging on the side of providing more information rather than less can prove beneficial. Hedge on the side of providing more information rather than less. “What we found is as [home hunters] are walking around and doing tours, they wanted to find out about this building that they were standing in front of,” Williams said. Buildings with no availability give renters the full picture on Aparments.com. 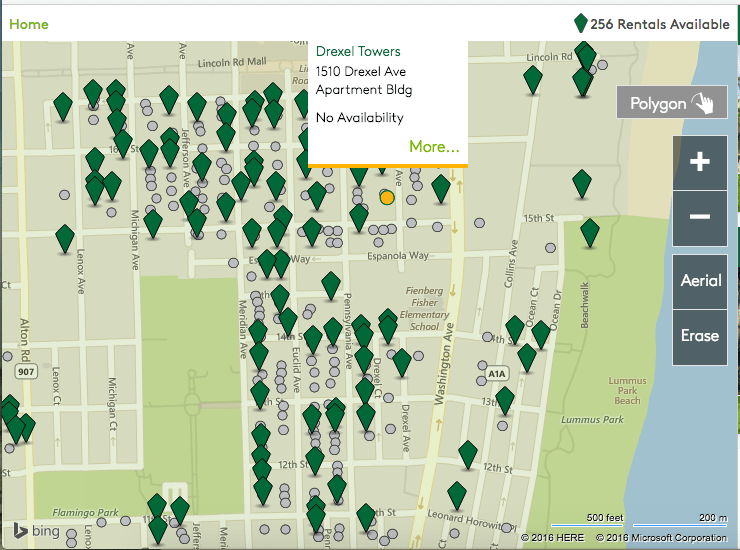 So in the early part of this year, the site added several hundred buildings without availability to its searchable database, clearly stating that there are no open units but also talking about similar nearby apartments, average rent ranges for the area and other questions that renters might have. Non-available buildings are designated with a different color and shape (small gray dots, versus green quadrilaterals).